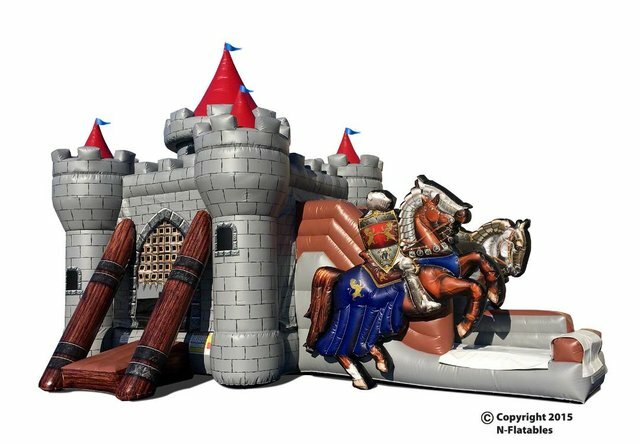 Setup Area: Height 19' 06" Width 19'6" Length 28'6"
This is a one of a kind Excalibar Castle with Horses Large Combo Design Bouncer. No other company has this. Your little prince or princess will love this and the photo's to go with it. Plenty of room to jump and slide. Bright colors with graphic print of characters. Inflatable Horses that turns into a slide. It features an inflatable safety ramp at the entrance to protect excited kids as they scramble to get inside the bouncer. It also has large netted vent windows that keep things cool for the kids and allows parents to keep a watchful eye on all activities inside. Appox 6-8 users at a time.